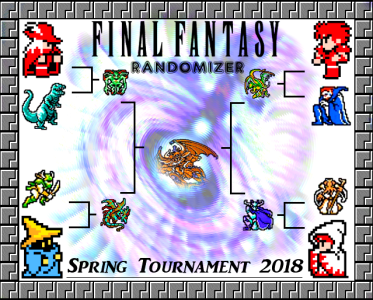 Welcome to the official Final Fantasy One Randomizer Spring Tournament! There are two stages: Swiss rounds, leading into a Best-of-3 elimination bracket. In the Swiss Stage, once per week, players will be paired with competitors of similar records in 1 vs. 1 race matchups. There will be five Swiss rounds. After all Swiss rounds are completed, 16 players will advance to the Bracket Stages. All undefeated players will be slotted into the Bracket Stage first, then 1-loss players, then 2-loss players, etc. If there are more players of identical win/loss records than there are slots remaining in the Bracket Stage, those players will participate in a group "play-in" race, with top finishers in the race claiming the remaining slots in order of play-in race result, advancing to the Bracket Stage. Bracket Stage players will complete a 1 vs. 1 Best-of-3 series each week to determine advancement, until a winner is decided. Brackets will all be Best-of-3. Entrants must use an emulator or console NES and the Final Fantasy Randomizer to play on. Savestates are not allowed nor is frame rate manipulation. Hard and Soft Reset encounter manipulations (Tent/Cabin/House) are permitted. Brackets are subject to change prior to official start of the bracket stage of the Tournament. Races must be broadcast or recorded offline and submitted for review and verification. The preferred method is to be featured in a live broadcast, offline recordings are a last resort option, in case you have dropped frames, audio or video issues while broadcasting live. All entrants will report their scheduling to a designated tournament admin such as Czar, ichbinmiah, Kababesh, xIceblue or Edgeworth. A period of 48 hours will be enforced for all entrants to schedule their respective match ups, within SIX days of the matchup annoucement. Once scheduled, both entrants will race upon the scheduled date and time and complete their race. If an entrant is unable to complete their scheduled race, they can reschedule within those SIX days. If an entrant is unable to complete their race within those SIX days, they will be disqualified. EXAMPLE: if a race between 2 entrants is announced on the 18th at midnight, they have until midnight on the 20th to schedule their race, and they have until the 24th at midnight to complete their race. Prizes will be announced during the tournament! Semi Finalist winners will each win 1000 bits or the equivalent of $10.00 USD. Tournament winner prizes are pending!